Part of the reason so many people eat out, is they think cooking has to be tough. Here is a simple recipe for a stir fry that you can make in 30 minutes. 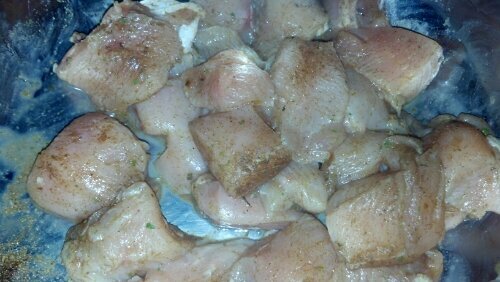 If you can marinate your chicken an hour or 2 before with melted coconut oil mixed with your meat rub. Set aside and let sit in the refrigerator. Saute Carrots, Green Pepper, Onion in wok with a teaspoon of coconut oil. Add the soy and sriarcha when the veggies start to soften. 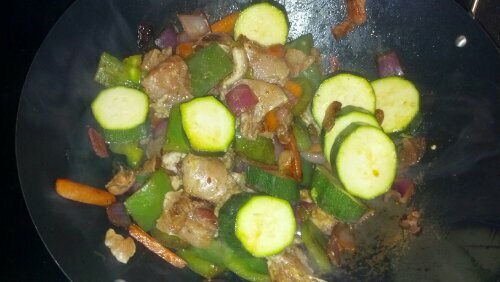 Add Chicken and finally Zucchini. 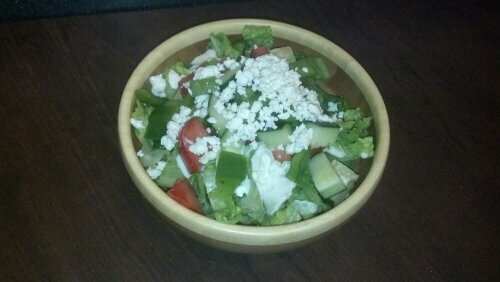 Chop Romaine, Tomato, Cucumber and place in bowl with low fat feta. Ta da, a dinner ready in less than thirty minutes! Real food is always better than takeout! I made almost the same meal a few days ago in an even more time-saving way – with the crock pot! Which was an extra bonus b/c I could prepare it in the afternoon and then it was waiting for me when I got home from my Sunday evening yoga. I put chicken at the bottom of the crock pot, then layered with sliced red onion, green pepper, yellow & green zucchini, and fresh heirloom tomatoes. Sprinkle with italian seasoning, pepper & sea salt. Cool for high on 1 hour, then low 4-5 hours and voila! 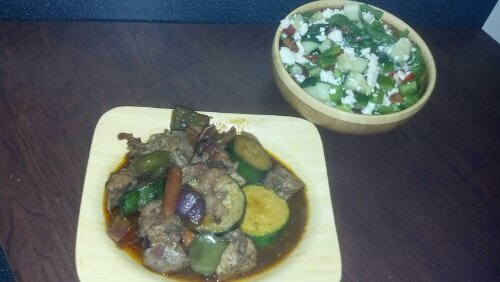 And I totally made up the recipe based on the veggies I had on hand. Totally! And I hadn’t used my crock pot for 6 months or so, but it was the kickoff day of the NFL season and fall is in the air in New England!